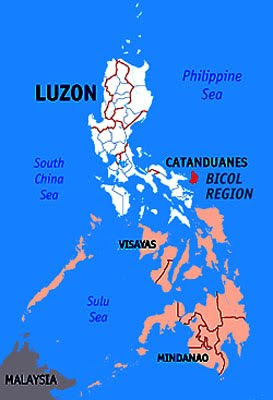 CATANDUANES, Philippines – More than 280 public and private schools in the town of Virac in Catanduanes, an island province in the Philippines’ Bicol region, benefited from the Books for Asia program of The Asia Foundation which distributed some 13,600 books on Friday. Mostly new children’s books and high school texts and college reference materials were distributed in the picturesque but typhoon-prone province, said Reynald Ocampo, Assistant Program Officer for the Books for Asia Program. Invited in the affair were Catanduanes Governir Joseph Cua, Virac Mayor Jose Alberto II, Congressman Cesar Sarmiento, Philippine Judicial Academy Chancellor Justice Adolfo Azcuna, Regional Trial Court Presiding Judge Lelu Contreras, Bishop of Diocese of Virac, Most Rev. Manolo de Los Santos, Department of Education Schools Division Superintendent Doctor Artemio Rivera, and other officers of the local government. Ky Johnson, Deputy Country Representative of The Asia Foundation, and Efren Balajadia, Director of the Books for Asia Program, presented the donated books to representatives of elementary and secondary schools, colleges, and universities. Balajadia said the books would help a lot of students in their studies. “It is my hope that these books and materials can help schoolchildren to revive and sustain their love of reading, especially in the midst of severe and ongoing challenges,” he said. “We can assure you that many parents and teachers will appreciate your generosity in providing learning materials to help elevate the literacy among our children and teachers as well. And we believe that as children have access to books and, they will be able to study more and have a better understanding and appreciation of the world we live in,” Cua said. The school superintendent also praised The Asia Foundation for its benevolent programs. “As we express our gratitude, we must never forget that the highest appreciation is not to utter words but to live by them,” Rivera said. The donation and delivery was made in cooperation with local governments and private partners, and will enhance the schools and libraries of communities in Catanduanes as part of a wider effort throughout the Philippines. For 55 years, The Asia Foundation has supported local communities to improve education for students. The Asia Foundation also thanked the continued support of public and private partners in the endeavor, including the provincial government of Catanduanes and the Municipality of Virac for encouraging education and literacy; Aboitiz2Go for its help shipping the donated books; and American publishers such as the McGraw-Hill Companies and Pearson Education for their donations of brand new books ranging from elementary through university levels. Books for Asia is The Asia Foundation’s longest running program and regularly distributes books and other reading materials for all educational levels in over 18 countries. Since it was started in September 1954, The Books for Asia program has distributed nearly 45 million books and journals to more than 50,000 academic and non-academic institutions throughout Asia. The Philippines alone has been a recipient of 13 million books and journals to public and private institutions across the country. More than 95 percent of Books for Asia’s donations are new textbooks, donated by U.S. publishers. The reading materials range from the elementary level to professional level, covering such fields as government, business, health, environment, information technology, social science, and international relations. Books for Asia have made a significant contribution to education in the Philippines, especially since resources for instruction tools and facilities are scarce. All educational levels have benefited from this program. Basic textbooks and supplementary reading materials have been donated to schools and libraries all over the country. NGOs are also recipients of valuable resource materials from Books for Asia. The Asia Foundation is a non-profit, non-governmental organization committed to the development of a peaceful, prosperous, just, and open Asia-Pacific region. The Foundation supports programs in Asia that help improve governance, law, and civil society; women's empowerment; economic reform and development; and international relations. Drawing on nearly 60 years of experience in Asia, the Foundation collaborates with private and public partners to support leadership and institutional development, exchanges, and policy research. With 18 offices throughout Asia, an office in Washington, D.C., and its headquarters in San Francisco, the Foundation addresses these issues on both a country and regional level. In 2009, the Foundation provided more than $86 million in program support and distributed nearly one million books and journals valued at over $43 million.